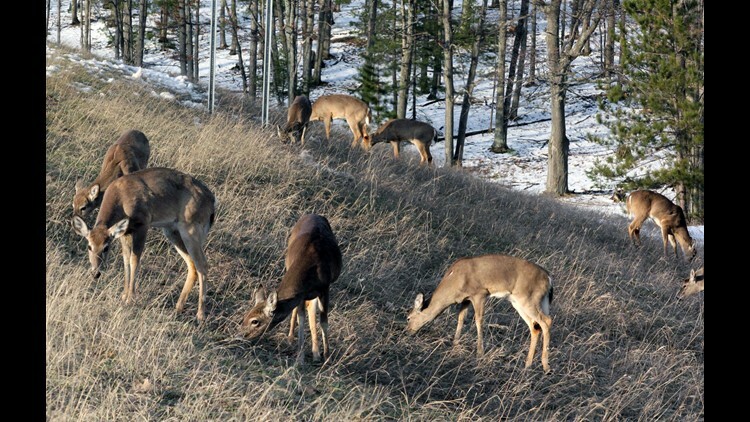 These deer feeding along a Michigan roadside in late April 2011 illustrate the argument by wildlife biologists who say that even a few feet of separation in natural feeding greatly reduces the risk of disease compared to deer feeding nose-to-nose at a bait pile. Michigan hunters should beware of bovine tuberculosis in deer after a beef herd in Alcona County was confirmed to have the disease. It's the 73rd herd to be diagnosed in the state since 1998, according to the Associated Press. Cattle in Alcona, Alpena, Montmorency and Oscoda must be tested before leaving their farms. Although bovine TB largely affects cattle, the Michigan Department of Natural Resources notes that the disease can be transferred between farm animals and wildlife. It shows up in the lungs, intestines and other parts of the body in animals. Michigan wildlife managers are also working to eradicate the disease from white-tailed deer in the state, reported Fox-TV (Mobile, Ala.). Hunters should look for lesions on deer's lymph nodes, lungs or the rest of the body while dressing deer. Meanwhile, farmers in the area should aim to keep deer away from cattle, assistant State Veterinarian Nancy Barr told the Associated Press.